Through the Outstanding Veterinary Anatomist Award, the American Association of Veterinary Anatomists recognizes individuals who have made outstanding contributions to anatomical education and/or research. One recipient is typically chosen each year that the AAVA holds a meeting, with the award presented at that meeting. Currently, meetings of the AAVA occur every two years. A selection of the more significant research or educational papers published by the nominee. Because some AAVA members work at smaller institutions with fewer colleagues, it is acceptable for letters of support to originate from non-AAVA members. The AAVA Executive Committee calls for nominations early in the calendar year of a scheduled AAVA meeting. The AAVA President nominates members for the Awards Committee. The Awards Committee carefully considers the eligible nominations and selects the award recipient. The Awards Committee is not obligated to grant an award each year. Any nominee not chosen for an award may be considered for subsequent awards. It is the nominator’s responsibility to resubmit a nomination package prior to the next award’s deadline. For further information, please contact Dr. Tina Clarkson at clarkson@umn.edu. 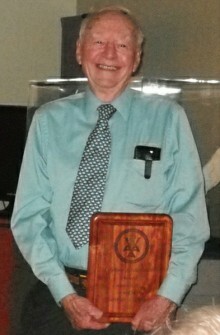 At the AAVA meeting at Cornell University in 2011, Dr. Howard Evans was presented with an AAVA Lifetime Achievement Award for his exceptional contributions to anatomical education and research.